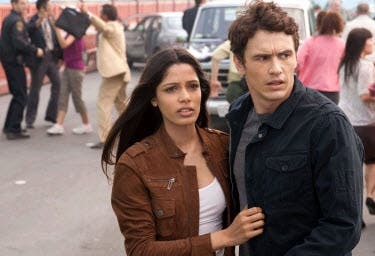 A new social order is about to take place on August 4 threatening humans in the event-movie “Rise of the Planet of the Apes” starring James Franco (127 Hours), Freida Pinto (Slumdog Millionaire) and Tom Felton (Harry Potter). Orchestrated by director Rupert Wyatt and Peter Jackson’s filmmaking empire Weta Digital, “Rise of the Planet of the Apes” breaks anew new grounds in moviemaking history using photorealistic apes instead of actors in costumes exposed to natural setting. Pushing the boundaries beyond movie making techniques used in James Cameron’s “Avatar,” the movie is a completely new take on 20th Century Fox’s most beloved and successful franchises. 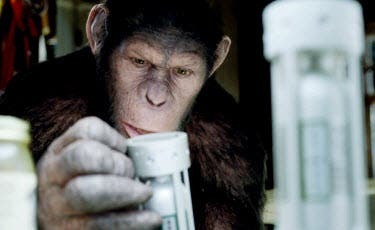 Owing much of its genesis to Avatar, “Rise of the Planet of the Apes” for the first time uses technology that allows audiences to emotionally engage with a lead character, a chimpanzee named Caesar (portrayed by Andy Serkis, ’Lord of the Rings’ trilogy’s Gollum), who does not actually exist. James Franco plays Will Rodman caught in the middle of an epic battle where the upended destinies of man and primate meet. As a scientist working within a large pharmaceutical corporation, Gen-Sys, conducting generic research to develop a benign virus that restores damaged human brain tissue, Will is committed to finding a cure for Alzheimer’s disease that afflicts his father, Charles (John Lithgow). When Will’s research test subjects suddenly display bizarrely aggressive behavior, the company shuts down his program. Will finds himself charged with an overlooked newborn male chimpanzee most promising of his test subjects destined for greatness named Caesar. Will secretly raises young Caesar as his own, at home, while caring for his ailing father. As the story progresses, he becomes more of a person and less of a scientist. This in turn leads Will to Caroline (Pinto), a primatologist who serves as Caesar’s vet, and who becomes a key player in both their lives. “The film taps into our most primal fear of the Alpha of our planet being usurped – literally letting another species take over the world – and asks how would that play out,” concludes Rupert Wyatt. “Rise of the Planet of the Apes” opens in more than 100 screens across the Philippines from 20th Century Fox to be distributed by Warner Bros.